In case you missed it, there’s already Express Maintenance in all Toyota Dealerships nationwide. It promises the same benefits of a complete Periodic Maintenance Service—only made faster, better and without the additional cost. MANILA, Philippines — Whether newbie or experienced, a motorist must be responsible to have his car undergo periodic maintenance (PM), which ensures excellent running condition, better fuel economy, longer vehicle life and higher resale value. Toyota, for example, advises a periodic maintenance every 5,000-km mileage, or every three months—whichever comes first. That’s an average of three to four PMs every year. Seems pretty easy to abide to, but note that one PM takes about at least two hours to finish. Factor in the volume of cars up for servicing in a day and a PM may last up to four hours. Two to four hours a day could already mean a lot of things for a motorist. It could mean driving kids to and from school. It could mean completing a trip to the grocery to buy supplies for the week. It could mean arriving at crucial meetings on the dot. It could mean spending more time with the family, or accomplishing a lot of important tasks for business or work. Toyota Motor Philippines understands these too. To save Toyota owners their precious time for the things that matter more, the leading car company in the country has developed a highly-specialized maintenance service. In case you missed it, there’s already Express Maintenance (EM) in all Toyota Dealerships nationwide, which you can book an appointment to. It promises the same benefits of a complete Periodic Maintenance Service—only made faster, better and without the additional cost. With EM, you can complete your periodic maintenance in just one hour from receiving to releasing of car—compared to the usual two to four hours max. How Toyota does this is a true feat in the motoring industry—after all, it is the first and only one of its kind. At every dealership, a service bay will be reserved just for an EM appointment. The Toyota Dealer will already prepare genuine parts beforehand. Upon arrival, you are then guaranteed with quality service. Three certified Toyota technicians will work simultaneously on your car using the latest tools and equipment made specifically for the EM service. They will begin by inspecting car’s interior, exterior, underchassis and engine, as well as checking the electrical components for the lighting, audio and AC. EM service also inspects the tires’ rotation, tread depth, condition and wear, which is done by placing it on the lifter and removing the four wheels. It also includes brake and multi-point inspection. And most importantly, the fluids will be checked, and the oil and oil filter will be changed. After all these, the car is sent to the wash bay for a bath, and then vacuumed for the final step. Your car comes out feeling almost brand new! For a holistic experience, Toyota made sure that availing of Express Maintenance is as simple as booking an appointment at your preferred dealer. Advance booking is recommended. When you book in the afternoon, rest assured that the one-hour complete service time is guaranteed. Toyota even calls you a day before and one hour before your scheduled EM appointment so you won’t forget. On your part, make sure you arrive 15 minutes before your appointment for your convenience. And believe it or not, Toyota’s EM doesn’t incur any additional cost. Yes, it’s priced the same as the regular Periodic Maintenance—proving just how valued Toyota users are. Your service advisor will inform you of additional repairs not included in the scope of EM, if the need arises. If you wish to proceed, this will not be covered in the one-hour complete EM service. Additional costs will also be added on top. And if you are a Toyota Mastercard holder, you can avail of your exclusive 10-percent discount on Toyota Genuine Parts, Accessories and labor. Set your Express Maintenance Service Appointment now. Call your preferred Toyota Dealership in order to ensure that you get the best quality service and genuine parts for your Toyota. 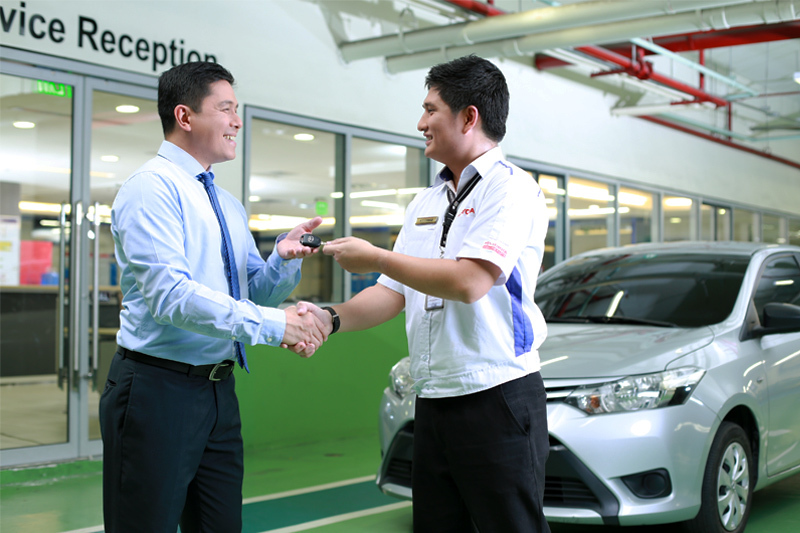 Look for the contact details of your preferred dealer at http://toyota.com.ph/services/dealers-search. For more information, visitwww.toyota.com.ph.